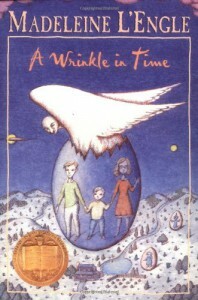 A Wrinkle in Time by Madeleine L'Engle is my favorite book. It's been over ten years since I have first read the novel, and it has taken me this long to be able to articulate what it means to me. For it was not just L'Engle's wonderful, imaginative story that captivated me, but the relationship between Meg and her younger brother Charles Wallace. When twelve year old me read this on my Poppop's boat during a hot summer day, it was years before my brother was diagnosed with Asperger's Syndrome, and this was the first time I encountered a person like him, Charles Wallace. By the time he was introduced, Meg already seemed more relatable to me than any other character I have read before, even though I was hopeless with arithmetic. Every time I reread A Wrinkle in Time I cannot help but smile at every one of these siblings' interactions, because it always takes me back to the first time when I thought, "Oh my God, this author knows what it's like to be me."